Wheaties cereal boxes have featured famous athletes since 1934, but never a motorcyclist—until now. 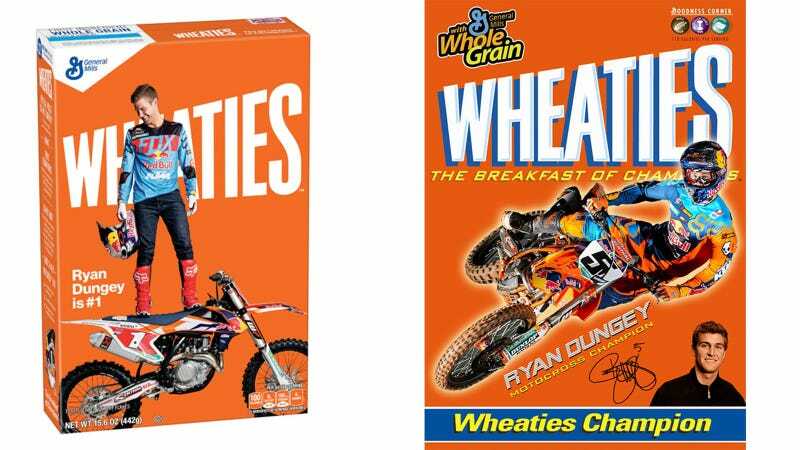 2015 Monster Energy Supercross Champion and KTM rider Ryan Dungey is the first rider on a Wheaties boxes, but hopefully not the last. Last year, Wheaties held a competition which let people vote for one of five athletes for the new cereal box. In the running alongside Dungey were UFC fighter Anthony Pettis, soccer star Christen Press, blade runner Blake Leper, and lacrosse player Rob Pannell. Lou Gherig was the first athlete to make the box’s cover back in 1934, and hundreds of athletes have been on it since. Michael Jordan put making the cover of the box up there with making the cover of Sports Illustrated with the “better eat your Wheaties” campaign back in 1988. It’s been a well celebrated sports achievement ever since. Dungey’s appearance on the box is just one more step in pushing Supercross and Motocross racing further into the mainstream public eye. Dungey was also the first motocross rider awarded with an ESPY, which he got for being the best male action sports athlete. 2016 looks to be a great year for Dungey, who took a strong second in the first Supercross of the year even after being knocked down. He’s finally putting all the pieces together and looks downright scary. He might be just the guy we need to push motocross mainstream.